Mortuorial Eclipse was founded in 2007 by Nefass (Guitar) , Darker Mysteria (Vocals) and Doom (Drums) in Córdoba city, Argentina, after shows in the underground scene Doom is separated from the band and Mortuorial Eclipse record the first Demo material (2009 unreleased ) that was a symphonic black metal with some death metal reminiscences at the beginning of 2010 Baal Herith (Keyboards) and Svart Sjel( Bass ) join to the line up .Later Thav ( Inferi lead guitarist ) joined to the cause and on 2011 and Kobal (Corporal Dissection Drummer ) became part of the Band. 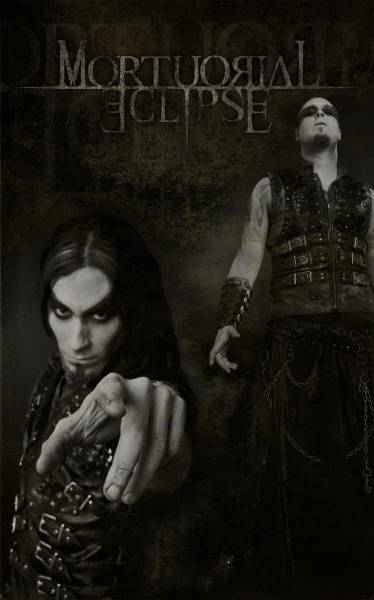 Before the first international Tour (2011) the band decided that Darker Mysteria must leave the band and Svart Sjel take the lead vocalist place to perform it shearing stage with bands like Dark Funeral and Krisiun between others, after that Svart Sjel is no longer in the band and at the beginning of 2012 Mortuorial Eclipse Record its debut album: The Aethyrs` Call" at Anger Vision and Vermin Studios in Cordoba , Argentina. This first work was Produce by Nefass, Co-produce by Matias Takaya and Mix and Mastered by Arek ( Malta ) Malczewski ( Decapitated , Behemoth ) in Poland then Edited by Ishtar Gate Productions Nationally. The style would be placed as Symphonic Blackened Death Metal, since the band combines basically orchestral elements and the extreme part and aggressiveness of the rest of the band. We have diverse influences not only of metal bands but also of classical and movies music indeed. We could consider as our most direct influences of bands like Septic Flesh, Behemoth, Dark Funeral,Nile, Morbid Angel ,Opeth, Dimmu Borgir and Vesania between many. They should appreciate what we do as band to get to know something new with the purpose of give and show them a different proposal. We have released our first debut album entitled "The Aethyrs`Call" in October and the impact of our music was as much for the public as for the media better than we had expected. Of course we play in live. We have played with important bands of the underground metal scene such as Dark Funeral and Krisium. The performance of our activity in live is increasingly better. They must know about our existence to make it know and disclose to people who is searching something like we are doing so far, since that we consider that our proposal as a band, can get interested and appeal to many metalheads and people who need a Different and Extreme sensation. First and foremost we have intended progress as much as we can as band to give our best to the rest of the world, and according to that criterion going on working on new stuffs like releasing new materials and making biggest tours throughout the world for a near future. You can find us either to listen to our album or to know more about us in many sites of Internet such as Facebook, Twitter, Youtube or through our own webpage www.mortuorialeclipse.com.ar where you will find all the info that you need, like how and where to buy our stuffs or just to know something about the band and follow our current activities.